Now that we’ve explored some deck building basics, it’s time to take a look at some good beginner decks in detail. One of the decks I’ve seen success with has been a Sorcerer Control deck. 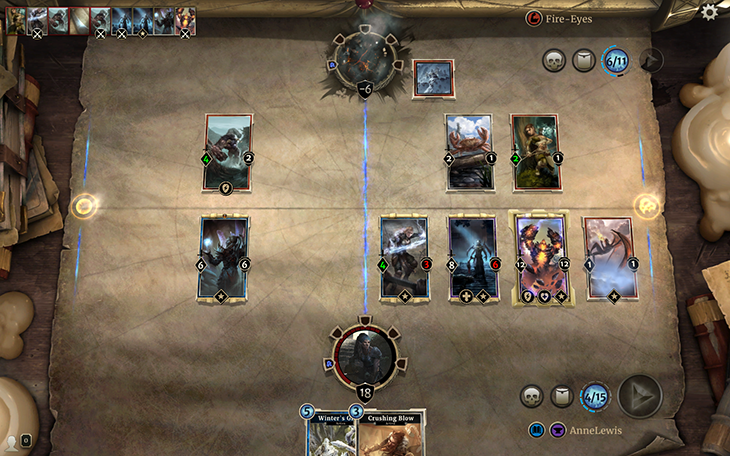 The Sorcerer deck, if you’ll recall, is the combination of Endurance (purple) and Intelligence (blue) cards. This means that we’re focusing heavily on spells and keeping ourselves alive. As I mentioned previously in our article on Advanced Deck Building Tips, I sometimes enjoy playing decks that look to control the early- and mid-game before taking over the game by playing haymaker after haymaker at the end. The following is the list I’m currently using and have been tweaking for the past week or so. As you can see, I have a ton of guard creatures, a lot of removal cards, and some really powerful high-cost creatures for the endgame. I also have some cards to benefit our bevy of guard creatures, such as a single Daedric Dagger and a pair of Watch Commanders. 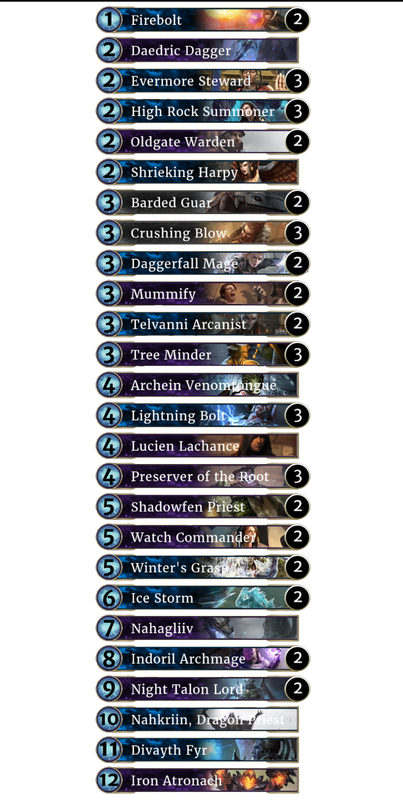 I was trying out different numbers for Ice Storm and Winter’s Grasp, and two of each feels correct. Winter’s Grasp is extremely versatile and allows me to not only stall the board while I attempt to stabilize, but it also lets me essentially attack two turns in a row while all my opponents can do is watch. Denying my opponent the ability to attack back in the final stages of the game can often win on the spot. At first I had three copies of Stalwart Ally in the deck. When he procs (an old MMO term for “processes”) and becomes a 3/5 with guard for three magicka, he’s fantastic. When he doesn’t, well, I kind of wish he was anything else. In my first couple of sessions he seemed to be triggering about 80% of the time. In the past few days however, I think I went about 0-9 on him being a 3/5. Eventually I replaced him with other things, like Telvani Arcanist. One thing I wasn’t taking enough advantage of in the beginning was card drawing. Thanks to their special Summon ability, cards like Daggerfall Mage and the aforementioned Telvani Arcanist are extremely vital in helping me not run out of cards to defend myself with. The most replaceable card in the deck is definitely the Arcein Venomtongue, but I haven’t found a card that fits better. I have a ton of spot removal (Firebolt, Crushing Blow, Lightning Bolt, Mummify) and I have a lot of expensive cards at the top end. One of the best parts about Legends in my opinion is that there are so many potential options. If you want to cut down on some of the legendary cards in the deck (of which there are 11), I think two of the easiest to cut are Nahkriin, Dragon Priest and Lucien Lachance. You can also feel free to replace one Blood Talon Lord with one Blood Magic Lord if that’s easier for you. 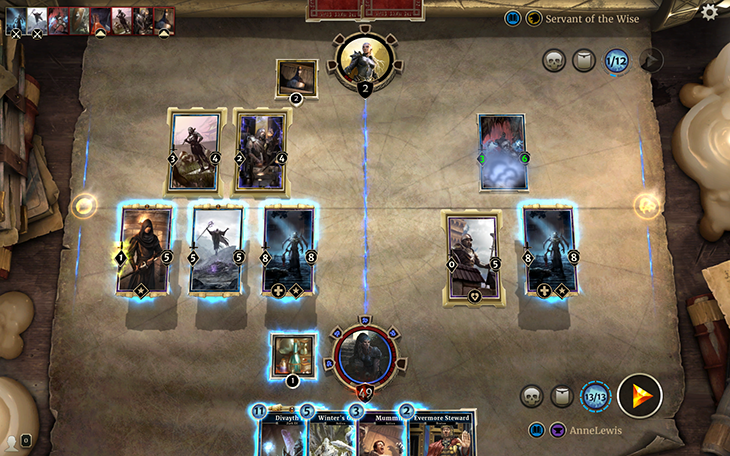 Similarly, Volkihar Lord is a card that is easier to access, and if that’s all you have it should be just fine. To be honest, while admittedly weaker, the most relevant part of the card is the Drain to enable us you get back into the game. You want powerful cards at the top of your curve that provide a good deal of card or board advantage. Daggerfall Mage, while an amazing card in the deck, can also likely be replaced by something else in the three magicka spot if you want to cut down further on legendaries. Don’t get me wrong, I love the deck in its current form, but I want to provide something playable for those with fewer options in their collection. I’ve been having a blast with this deck the past few days. I can really feel when the tide turns in a game. If you want to check out some of the decks I’m working with in action, follow me on my Twitch channel, where I’ve been streaming Legends regularly.